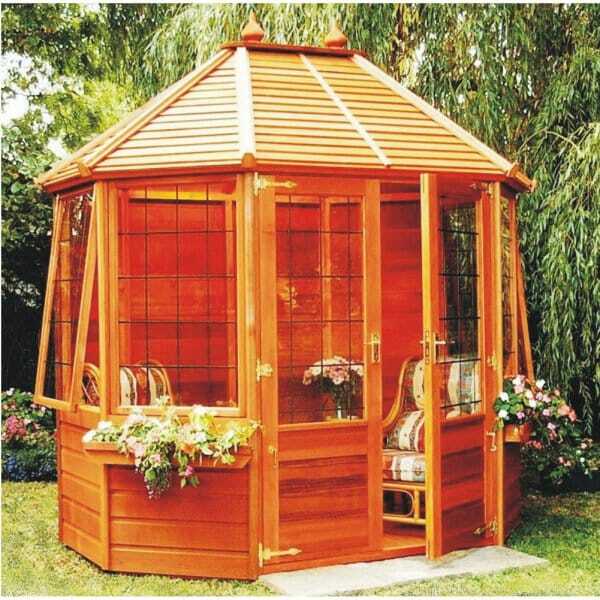 A1 Alconbury Cedar Octagonal Summer House: 6 x 6 / 6 x 8 / 8 x 8: The A1 Alconbury Cedar Octagonal Summer House is top of the range summer house from A1 Garden Buildings. A summer house is the perfect place to spend warm afternoons and evening with in peace and quiet, the octagonal base of this summer house is a practical size for your favourite garden furniture and other items. The summer house is finished in cedar cladding with has been pre-treated so you can focus on getting the building up quickly. You also have the option to choose from three attractive window options, all included in the price of the building. The optional Fibreglass roof has the look of slate but with none of the upkeep, a low maintenance roofing solution.